If you don’t know much about quinoa then you’ll be pleased to learn that it one of the most nutritious superfoods on the planet, offering a full spectrum of amino acids, plus fiber, nutrients, and omega 3 fatty acids. 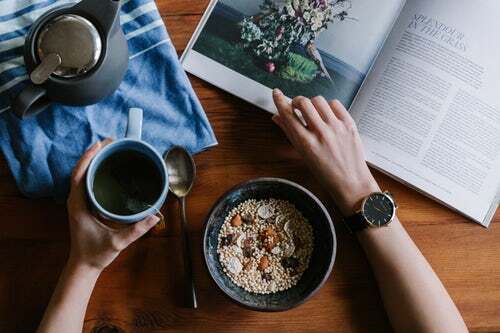 They are just some of the great reasons as to why you should be eating this glorious little seed as much as you can, and one way to do that is through these delicious healthy quinoa breakfast recipes. Since becoming a plant based eater, it means I have had to really think about food in a different light. For instance, I can’t just throw together what was my usual meat and 2 veg anymore. I have to think about what I am doing and make sure I am giving my body everything it needs through proper food combining, and the understanding of plant based macronutrients. Quinoa is a perfect plant based food offering ALL 9 essential amino acids in sufficient amounts to be useful in the body. Amino acids are the building blocks of protein which is vital in keeping muscle mass high, and also for the synthesis of hormones and neurotransmitters. Amino acids are categorised into 3 groups: non essential (meaning the body can produce its own), conditionally essential (meaning the body can produce its own unless specific circumstances stop the production, such as certain illnesses or stress), and essential (meaning they must be put into the body through diet or supplementation). As quinoa contains considerable amounts of all the essential amino acids (which is something that can only be found in a few other sources in the in the plant world) it stands to reason why it is known as such a healthy food. There are actually around 120 different types of quinoa; pretty mind blowing considering you only really see 3 different types for commercial use which are the red, black and white – the most common being the white. Quinoa is part of the Amaranth family and originated in the Andean mountains of South America, and was also a very important crop for the Inca empire. It has tripled in price now that it is so popular the world over. HIGH IN ANTIOXIDANTS – Important for scavenging free radicals in the body, and ANT AGING! The great thing about this versatile seed is it can be used at quite literally ANY meal; both savoury and sweet, at ANY time of day! There’s not many foods you can say that about, that’s for sure. An alternative to rice, pasta, potatoes or any other carb you may be wish to eat, depending on the dish. As it most closely resembles rice, then it makes sense to use it more as a rice alternative with maybe curry or chili. Use as a protein in itself, alongside some roasted vegetables or a mixed salad. Grind up and used as a flour in cakes, breads, healthy cookies, or anything else you would normally use flour in. You should halve it with your normal flour as it’s pretty heavy to use on its own; plus it will not rise without some kind of raising agent. You can easily make your own flours at home instead of paying 10 times more to have it pre-ground. As a pudding or porridge. As a great soft food for your toddler or kids. What colour tastes the Best? 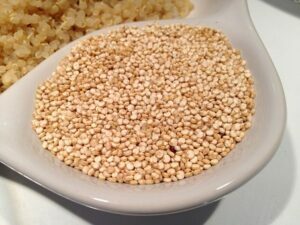 White quinoa is the most readily available, and can be used in any dish both sweet and savoury. It tastes creamier and cooks up fluffier than the others, which is why it is best for deserts or sweet dishes. It is the best one to use in dishes that you would normally use rice in as its flavour will not overpower the dish, and it will soak up other flavours and juices. Red quinoa is hardier and can stand up to more cooking and mixing. It has a nuttier flavour, and holds its shape and texture well, making it the best for complimenting salad dishes. It doesn’t seem to soak up the juices of a dish like you would want it to in the case of a curry, so maybe don’t use if for that purpose. 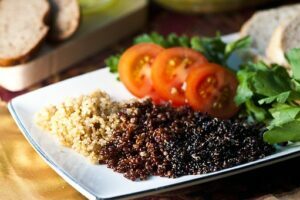 Black quinoa is similar to red and has an earthy flavour. Again, I wouldn’t use it for dishes that you would like more ‘soak’ with. Tri colured quinoa is a mix of all 3, and I find that because it contains the white you can get away with using it as a rice substitute. Not so great in sweet dishes due to the more earthy flavours of the red and black. Wash thoroughly before use to be sure to be rid of all impurities. Add to a pan and cover with the same amount of water. It tends to double in size, so bear this in mind when thinking about portions. If you prefer your quinoa on the softer side then it will two third its size. Add a generous pinch of salt; or cook in stock for a better flavour. If you are going to be using your quinoa for a sweet dish, then just boil in water alone; OR in some kind of nut milk for creaminess. Boil gently for 10-15 minutes until your liquid has absorbed; you may need to add more as you go if it is not soft enough for your liking. This method will semi cook the quinoa leaving some extra cooking times with your milk and other ingredients in the actual recipes. All based on a 2 person serving. You can use quinoa flakes too but you will have to adjust your cooking times as per pack instructions. Rinse the quinoa thoroughly in a sieve to get rid of all impurities. If it hasn’t soaked up all the water then drain and rinse. The aim is to not fully cook the quinoa as you want to finish off your cooking in nut milk as per the recipes below. This one is a comforting winter warmer plus a fat burner! Cinnamon will help keep your blood sugar stable and also lower the GI of the whole meal; and the chia is a high fiber, nutrient dense, omega 3 seed to help set you up for the day. Add your nut milk to the quinoa and bring to the boil, then simmer for a couple of minutes. Add chopped apples, cinnamon, vanilla and chia seeds and simmer for a further couple of minutes until quinoa is the texture you require. If you prefer a runnier porridge then add more milk; if firmer then add less milk or simmer for longer. Drizzle with sweetener of your choice and enjoy! Sultanas are not only super sweet and delicious, they are also a proven fat burning food and are super high in anti aging antioxidants. Nutmeg is great for digestion and is yet another powerhouse of antioxidants, so be GENEROUS with it. Cook your quinoa in nut milk for a couple of minutes. Oat milk is particularly good in this one! Add mushed banana, sultanas, and nutmeg to taste. Simmer for a few more minutes until desired texture and consistency is acquired. Eat on a cold winters day! This one is scrummy just for the sake of being scrummy and reminds me of my year spent in Southern Spain where strawberries where dirt cheap, tasty, and available everywhere. 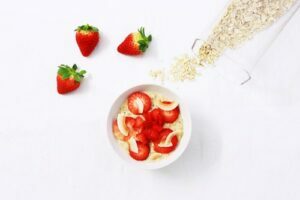 Back then it was strawberry porridge with traditional oats that I made for my breakfast most days, but these days I like this lower carb quinoa version too. The coconut chips just give it an added je ne sais quoi that just makes it taste summery and delightful. Simmer your quinoa and coconut sugar in the milk for 5 minutes until almost ready to go. Add your chopped strawberries and warm through quickly; don’t over cook. Sprinkle with toasted coconut chips. Enjoy on the balcony in the morning sunshine! If you’re a chocoholic like me and need an excuse to eat it for breakfast, then look no further. 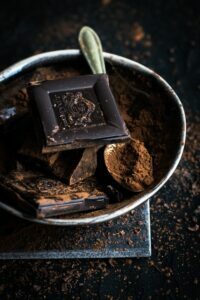 Cacao and dark chocolate have so many antioxidants and health benefits that it is actually a healthy food, and a million miles away from the sugary candy type stuff. 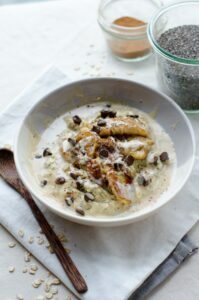 And as the flavenols in cacao and dark chocolate help sharpen your brain and boost cognitive function then what better could you eat to set you up for the day than this chocolatey porridge. Add your quinoa to cold nut milk and bring to the boil; simmer for a few minutes. Add your mashed banana, cacao powder, vanilla, and sweetener and cook until required texture is acquired. Should be a few minutes. Serve and add fresh raspberries, grated chocolate and coconut yogurt if using. Blueberries are PACKED full of skin boosting, anti aging antioxidants, are low GI (so good for fat burning), and can also help boost memory and brain power. 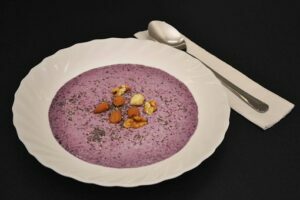 Just try to keep your blueberry cooking to a minimum as not to destroy any of those wonderful nutrients. Bring quinoa to the boil with the nut milk, sweetener, and chia seeds and simmer for 5 minutes. Add your fresh or frozen blueberries and heat through, mashing a few up with a fork as you go so the whole thing turns a deep purple colour. Serve with a sprinkling of fresh chopped walnuts and some further fresh blueberries. Thanks for reading, and I hope you enjoy your quinoa porridge. Be sure to let me know how you get on, or if you have any other suggestions for quinoa as I would sure like to try them out. Please feel free to drop me a line below! Hi, I have never tried quinoa and I am so happy to have found your website, Its great to know that quinoa is healthy as I have been looking for alternatives to pasta and rice (I’m a huge rice/pasta lover). From what you have stated here, it seems quinoa is way healthier than pasta/rice. Would you say this is the case? I have bookmarked your website and would definitely be trying all 5 recipes, starting with the double chocolate heaven! Thank you. Hi Bea, yes quinoa is DEFINITELY heathlthier than rice and paste, a hundred times healthier! It’s a complete protein and food in itself with high amounts of vitamins, minerals and omega 3 fatty acids. It has it all, which is it is a known superfood and has been used for nutrition for thousands of years. Definitely give it a go and see what you think, I hope you like the recipes, I think I have made them as tasty as they can be. Feel free to let me know how you get on! Ooo a substitute rice pudding sounds good! I don’t like rice, but I do love rice pudding lol. What about making a substitute tapioca pudding? Would that work as well? Hi Buffy, you know what? They both sound like great ideas, and yes, why not! I’m pretty sure you could just cook your quinoa slowly in all milk from the start and it will come out creamy and delicious. I’m tempted to say you should use something really creamy like coconut milk mixed with coconut cream milk too. Yum. Think I will give it a go for myself so thanks for the idea! I’ve only recently discovered the joys of quinoa (and how to pronounce it!) and I hadn’t thought of having it for breakfast! Love the strawberry coconut recipe, it sounds delicious. My 3yo isn’t always that fond of the texture of quinoa – do you think it’s worth trying a different colour? Is the texture any different? Hi Amy, yes I love all things coconut and strawberry which is why that flavour combination is one of my favourites. Yes, the other colours are a different texture; not so fluffy and slightly grainier so he may prefer that. Or, you could try the quinoa flakes as it has a completely different texture to the whole grain; it’s more like porridge oat texture so I’m sure he will not even know he’s eating the same thing. I hope you can get your boy to like it as it’s just SO nutritious and would be awesome for growing kids, so give it a try, and good luck! I’m drawing a complete blank here. I’ve used quinoa to make reboflac. I don’t think that’s the right name for it, but I just can’t think here. Anyhoo, I like the red and black because of the firmer texture. Those would be great dinner accompaniments. However, for breakfast, I like the Berry and Chocolate recipes. I especially like the chocolate because I am a chocoholic and need some healthy alternatives. Ha ha, I’m a chocoholic too so we definitely have something in common there! 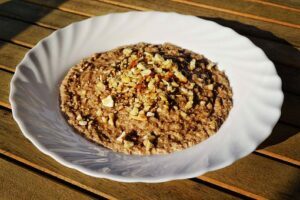 I find the red and black are better for more savoury dishes as they have a much earthier flavour, but that’s just my opinion and you are welcome to try them in the chocolate quinoa porridge. To be honest, chocolate makes everything delicious huh? I have no idea what reboflac is; seems like a very strange name, I will Google it! I’ve always been meaning to try quinoa! I’m definitely going to try the Double Chocolate Heaven one since chocolate is one of my weaknesses haha! I’m happy to have encouraged you to try this awesome little seed as it is SO healthy! I hope you love it and do lots of experimenting with it as your health will definitely thank you for it. Please let me know what you think. The chocolate is my favorite too! I’ve been eating quinoa for some time, either as part of a salad or vegetable bowl, or as a rice-substitute side dish. It never occurred to me that it could be part of a breakfast meal. But why not? Now that I think about it, it’s kind of like an oatmeal substitute in that sense, or cream of wheat even (or grits, if you are from the southern United States!). One thing that comes to mind (and I only recently discovered this) but inulin might make a good sweetener for dishes like these. Inulin is prebiotic fiber (yes, fiber) but it it is also naturally sweet. Not as sweet as table sugar, but I’ve started mixing it in with chia seeds and flax milk and it definitely adds some noticeable sweetness, so it sounds like it could work here as well. Thanks for the recipes! Love the sound of that first one! Hi Jon, I’m glad you already understand the benefits of quinoa. Yes, if you eat it as a breakfast then you can’t give yourself a better start to the day. I’ve been doing this a lot lately and find that it keeps my blood sugar stable and stops me from snacking all morning. And not many things do that! Wow amazing article, I have never tried quinoa before and I didn’t know that it has all nine essential amino acids. Your sweet recipes are great too; especially I liked blueberry beauty recipe and I will definitely try it. Most of your recipes include both quinoa and chia seeds, which is very healthy, because I know that chia seeds are classed as super food too. After reading your article and as a healthy lifestyle enthusiast I must include quinoa to my diet. Thank you for sharing it with us! Hi Marius, yes if you are into healthful foods then you simply must try quinoa as it is a powerful superfood thats been used for thousands if years. The fact it contains such a great amino acid profile is rare for a plant food which is why it is great for vegans and plant based eaters. Please let me know how you enjoy the recipes. I’m surprised that I haven’t heard about quinoa since there are 120 different varieties of this food. It’s super to learn about it though. It seems like it has many health benefits that shouldn’t be overlooked. I like the recipes you are giving. They all sound very delicious. I’ll take banana sultana with me. Hi Ivan, I’m surprised by how many people haven’t heard about quinoa. I’m wondering whether it is just a big thing here in the UK where it has had lots of publicity as being a superfood. Although there are over 120 varieties you only ever really see white, red, and brown/black, with white being the most popular. I have no idea where all those other ones are sold. Hope you enjoy your banana sultana! Hi Stefanie, thanks for this post, it is really helpful. Although I am vaguely familiar with the benefits of quinoa, sometimes it is good to have a great reminder. Especially that it can be used as a protein in its own right – which is important as although I still eat meat, I also actively choose to increase plant-based meals and options in my weekly routine. Plus, I had never even thought about using quinoa for breakfast! That is so great because I can make it up and then take into work to eat – easy! Finally, thank you for explaining the differences between the different coloured quinoa, this is very helpful and why I am bookmarking your page for future reference and to use these great recipe suggestions you shared. Am trying out the Apple, Cinnamon, Chia option tomorrow morning – thank you! Hi Fleur, I’m chuffed you are going to try the apple, cinnamon and chia quinoa tomorrow; I really hope you enjoy it. Of course, all these recipes can be tweaked to suit your own tastes, and you can easily make up more variations as you go along, but I like to eep things balanced with healthy fats, protein, and fruits etc. It’s good to get the best of all words, especially for your most important meal of the day which is breakfast. 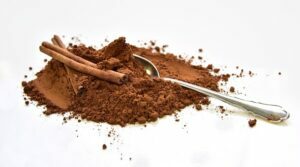 This is a great, easy to read post which I think will help people find ways to incorporate this valuable superfood in more of their cooking. It’s so versatile. I’ve used it to replace rice before, but hadn’t thought of it for porridge. I especially love that you’ve included it can be used for baby foods. I think new mums are told so many differing ideas, that if they can see this is beneficial for their bub’s belly as a food to introduce, it will help increase their nutritional value. I also love the recipes you’ve included, this will certainly help me get new ideas to help feed the family, thanks :). Yes, I cannot see why this wouldn’t make a fantastically healthy baby food as it’s so versatile. You can add any flavours or natural sweeteners to it to make it palatable’ plus it’s cheaper than most jarred baby foods with no rubbish or preservatives. What’s not to like! I hope your family enjoy the recipes, and thanks for commenting. Ooh…these look good! I get stuck in a rut of eating the same breakfast nearly every day. Oatmeal is my usual because I can do so many things with it. I also eat Greek yogurt with fruit and walnuts sometimes. I have not ever eaten quinoa for breakfast but I have a feeling it’s going to be my new favorite! Yum, I love yogurt with nuts and fruit too, but I go for the coconut variety. I’m sure you will fond these quinoa recipes something new and exciting to try and I hope you like them.